Oak double-leaf doors have long stood for nobility, strength, and security. You can find custom, ornamented oak doors for most every period home. 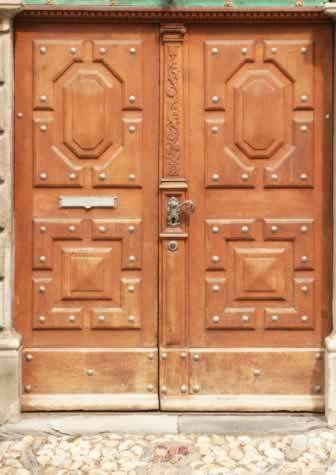 This Mediterranean set of oak doors employs raised medallions, ornamental headers, fortified molding, and heavy kick panels to create an air of invincibility. And with oak, the hardest wood ever used for door materials, you can rest assured of lasting value when cared for properly with stains. The rich colors and natural patterns in oak lend the wood to a wide range of uses in traditional, historical, or neo-classical architecture. Period hardware that features modern locking mechanisms protect your investment without compromising on the right look for your era. This example, used to set apart a residence in a rowhouse or block of flats, adds the right character and individuality to a formal theme.